Looking for a Stage Hypnotist in Orlando? As a comedy stage hypnotist in Orlando, based out of Florida, Richard Barker is constantly invited to perform his hypnosis show at Florida Universities and Colleges. The students revel in the comedic approach to Barker’s hypnosis demonstrations. The interactive segments of the hypnosis show have the university arenas echoing with applause and laughter. 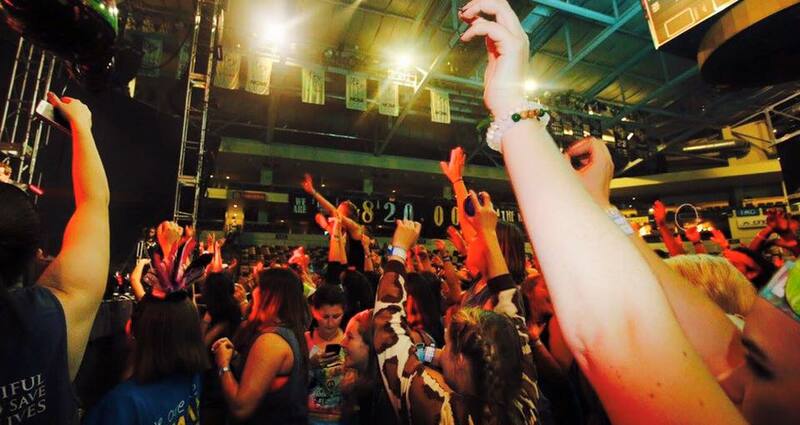 Check out the video below from the live hypnotic performance involving the students of UCF in Orlando, Florida. You will see how the Incredible Hypnotist put the students under a trance to perform a laugh out loud hypnosis show. Although all of Barker’s shows vary in content and embedded suggestions, here is the main timeline of a hypnosis show. 1. Initial Hypnosis Volunteer Selection. Barker gets the students excited and ready for the high-energy show by briefly explaining how hypnosis works. He helps the students to understand that hypnosis is not a magic trick or a specific science. As hypnosis isn’t a set science, Barker needs to expertly select the students that he believes will be excellent candidates that will go into a state of hypnosis quickly. The Incredible Hypnotist also has his eyes peeled for volunteers that have outgoing personalities that can bring that fun energy to the hypnosis show. The Orlando Stage Hypnotist will then go through a series of hypnotic susceptibility exercises to test which of the volunteers are more eager and willing to go into a state of hypnosis. As you will see in the UCF comedy hypnosis show video, Barker starts off with 20 volunteers and takes them through these tests. Look closely and you will see the subtle ways the Florida stage hypnotist can gauge a volunteer’s susceptibility level. Barker will be paying close attention to which participants can focus in on his voice; while blocking out all of the distractions in the arena. He will also ask the volunteers to perform simple suggestions to observe their responses. The Incredible Hypnotist has been hypnotizing audiences for 20 years and has the experience and expert knowledge to quickly judge if someone is a suitable candidate for hypnosis. As seen in the UCF video below, the Stage Hypnotist in Orlando asks specific individuals to stay on the stage while dismissing students he believes will not go under. If a student was asked to go back to their seat it doesn’t mean that the student can’t by hypnotized in the future. It just means that during his hypnotic susceptibility tests, Barker noticed that the volunteer would need more time to go under, or that the distractions of a loud university arena were too much for the person to truly focus. Left with the highly susceptible volunteers, the show can truly begin. In the live video, you will also see the Incredible Hypnotist pull some additional volunteers up on stage. These people showed signs of high susceptibility just by listening to the initial hypnotic conditioning. World Famous Rock Stars Performing an Impromptu Concert. International Cow Farmers Showcasing Their Expert Milking Skills. Infected with Jumping Beans Causing Them to Jump Wildly in the Audience. Grossed Out and Also Extremely Pleased with the Smell Omitting from Their Neighbor. Exotic Rappers from Foreign Lands Performing a Hilarious Rap Battle. The College Boys Turn Into a World-Renowned Boy Band. An Audience Member Becomes a Belly Button Thief. Gorgeous Lip Models, Dance Contests and More! Watch the full Orlando comedy hypnosis show and experience the hilarious moments that happened at the University of Central Florida. If you enjoy the video, be sure to subscribe to our YouTube channel and be alerted whenever we post a new hypnosis video. The host of this Orlando comedy hypnotist show was none other than the gallant Knights of UCF. Established in 1963, the University of Central Florida is home to roughly 65,000 active students and is the alma mater of 260,000 alumni students. With a rich class curriculum, this Florida school is a great institution that shapes and molds the minds of young adults in the Orlando area. On this particular night, the University of Central Florida teamed up with the Incredible Hypnotist to raise money for the Children’s Miracle Network Hospital. During the Dance Marathon fundraiser, the entire event was able to raise $1.25 million for the miracle families of the program. If you’re searching Google to find a “Comedy Stage Hypnotist Near Me,” you’ve come to the right place. Richard Barker is an Orlando-based comedy stage hypnotist that has performed in the biggest and smallest cities of Florida. Take a look through some of the headlining events the Incredible Hypnotist has performed in Florida. Florida Stage Hypnotist Richard Barker has also performed at the University of Florida. Watch the full comedy hypnosis show performed at UF by the Incredible Hypnotist. Just like his performance at the University of Central Florida, this hypnosis performance was part of the UF’s Gator Dance Marathon in Gainesville, Florida. Watch as the Incredible Hypnotist hypnotizes Peter, the incredible host of Orlando Live, on live television. In this fascinating video, you will witness the Orlando Stage Hypnotist demonstrating the power of a rapid induction. Peter quickly get put into a trance and is unable to take his super glued hand away from the wall. Can Someone Get Stuck in a Hypnotic Trance at a Comedy Show? This is a wildly false misconception of how hypnosis works. First off, all professional stage hypnotists will talk their volunteers back into a conscious waking state. You will see hypnotist Richard Barker do this in the video above. Some hypnotists will also embed a safeguard suggestion that if the volunteer doesn’t hear the hypnotist’s voice for a specific period of time, they will emerge from their hypnotic state. Learn more about the common misconceptions of hypnosis in our special blog: Comedy Stage Hypnosis Show FAQs Answered. Can a Comedy Hypnotist Tell if Someone is Susceptible to Hypnosis? Yes, as mentioned in the hypnosis blog above, there are sneaky suggestibility tests that we stage hypnotists use to see if someone is susceptible to hypnosis. Remember, you’re dealing with a professional here. Experienced stage hypnotists are able to easily interpret signs of someone’s susceptibility levels. They look at physical signs like pupil dilation, postural sway and someone’s accuracy to follow visual versus audio instructions. Learn more about the Handclasp Hypnosis Susceptibility Test or the Herbert Spiegel Eyeroll Test on our blog here: Comedy Stage Hypnosis Show FAQs Answered. Will I Embarrass Myself If I Volunteer at a Comedy Hypnosis Show? Let’s get one thing straight: hypnosis does not make you act out of character. If the stage hypnotist gives you an instruction or suggestion that you don’t feel comfortable acting out, your brain will block that suggestion. A professional comedy hypnotist will not give suggestions that intend to make you outright embarrass yourself. The comedy hypnosis show is designed to allow you to have fun with hypnosis; the suggestions will not be malicious or dark in nature. Learn more on our award-winning Comedy Stage Hypnosis Blog. This entry was posted in Blogs, College Hypnosis Shows, Comedy Stage Hypnotist, High School Graduation Hypnotist and tagged College Hypnotist, comedy hypnosis show, Comedy Hypnotist, Comedy Stage Hypnotist in Florida, Florida Hypnotist, Graduation Hypnotist, Orlando Hypnotist, Stage Hypnotist in Orlando, UCF Hypnotist.